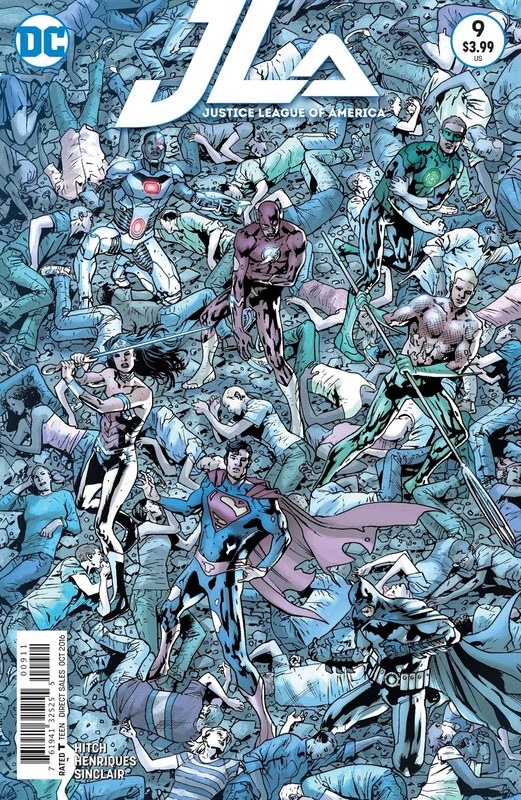 Justice League of America #9 is the eighth installment of the “Power and Glory” story arc. Before diving into this review, a word of caution—if this is your first issue in the series, I would recommend you go back and read the previous issues first. The story is difficult enough when it’s read in the proper order. I doubt anyone would be able to understand it otherwise. 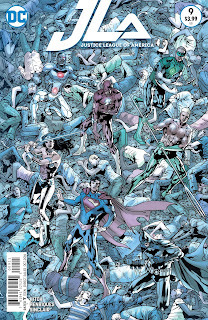 At the conclusion of the seventh issue of “Power and Glory”, Batman and Cyborg managed to disconnect the Kryptonian god, Rao, from his billions of followers on Earth. Victory, however, came with a heavy cost. Clark Kent, Superman, is dead. The Green Lantern is still stranded on Krypton 250,000 years in the past. Lastly, while Rao’s connection to his followers has been severed, he is still a Kryptonian under the glow of the Earth’s yellow sun, and therefore possesses the same abilities as Superman. Without our own Kryptonian available to fight him, Earth is in grave peril. The initial two thirds of this issue shift between the Flash and Green Lantern on Krypton. If you've been keeping up with this story arc, you may remember a scene in part six involving the Flash and Vince’s team in which their location was mysteriously labeled, “Somewhere”. That somewhere is Rao’s cathedral, traveling through space before it landed on Earth. The Stones of Forever have brought them here in search of Rao’s Stones of Life. Vincent, the Flash, Alexis, and Jane dash out of the Infinity Corporation building as the Forever Stones continue to act erratically, emitting dangerous amounts of energy and singing, “They’re here. They’re here.” As the four exit the building bickering at one another, they are met by Rao’s prophets. Surrounded, it appears Rao’s prophets are prepared for a fight when Rao himself emerges and tells them there’s no need for violence. Rao explains that Vincent’s Stones of Forever from Earth are singing to Rao’s Stones of Life from Krypton. This intrigues Vincent, and he agrees to show Rao his stones, hoping to gain vital information that has eluded his team for years. It is during this conversation that the Flash reveals he has only met one other Kryptonian, Superman, on Earth. If this seems strange, remember this is before the Flash fought Rao in part seven. In fact, it appears that Rao’s knowledge of Earth and Superman spawned entirely from this moment. As soon as Rao feels he has heard enough of the information Vincent has to offer, he betrays them by ordering his prophets to convert them. Vincent is struck, but manages to resist the conversion. No doubt this will be an issue of importance in a future installment of the series. The Flash easily dispatches Rao and his prophets. Without the yellow glow of Earth’s sun, these Kryptonians aren't any more formidable against the Flash than normal humans. The Flash and Vince’s team manage to escape and are transported back to a power plant to fight Rao and Parasite in the scene from part seven. Back on Krypton, 250,000 years in the past, Green Lantern has had better days. He is currently being held captive in the citadel of Argo by the Rao from the future. Rao has disabled Green Lantern’s ring, and there doesn't seem to be any viable method of escape. The Rao from the past and the Rao from the future argue about their legacy. Past Rao believes his future self has lost touch with their original intention: to serve Krypton and to calm the people who war on themselves so they may advance and better their lives. Rao from the future argues his world no longer experiences hardships such as war, disease, and famine. His followers call out his name in worship and joy. The fact that he will live indefinitely and his followers will die a few years before their time seems a fine trade off to this Rao. After this discussion, Rao from the past brings food to Green Lantern in his cell. We learn through their conversation that Rao from the future is converting all of Krypton’s warriors and siphoning off their power. Slowly but surely, it becomes clear Rao arrived on Krypton in this distant past directly after the final battle on Earth in part seven. His intention is finally made clear: to transport ancient Krypton back to present day Earth for a rematch with the Justice League of America (JLA). With an army of thousands of super charged Kryptonians, does the JLA stand a chance? Certainly not without Superman. Back on Earth, Diana has been administering CPR to Superman for fifteen minutes. The remainder of the JLA tries to convince Wonder Woman there's no hope at this point. Superman isn't coming back. Unable to accept the death of their friend, Diana lashes out with the thunderbolt of Zeus, striking Superman in the chest with what essentially becomes a divine defibrillator. Finally, after much hand-wringing, our Man of Steel draws breath once again. The celebrations are cut short, however, by the arrival of ancient Krypton. Finally! At long last all of our heroes are in one place, relatively speaking, and more importantly at the same time. But does the JLA stand a chance of combating an army of Kryptonians with the same abilities as Superman? How much more dangerous can Rao be now as he feeds from their life force? What hope could Earth possibly have? We will have to wait for part nine for the answers to these troubling questions, but the Rao from the past has placed his bets on Green Lantern, who has just escaped from Argo with his ring restored. The Verdict: Although this story arc is difficult to follow, it is a fun ride. Rao is a compelling character. A Kryptonian god? I don't believe DC has explored a story similar to this one. It is interesting to imagine what must be going through Superman’s mind. Krypton, an ancient dead world, has suddenly not only sprung to life but arrived on his adopted doorstep. Upon meeting Rao, Superman was enamored with him. Now he knows Rao has tampered with Kryptonian DNA to elicit this response. Superman has been genetically modified to worship Rao without question. But for the distrustful nature of Batman, and his heeding for Clark to come to his senses, Superman might not have been able to break Rao’s spell until it was too late. This issue is intended to explain Rao’s plan. While it can be a bit confusing, when you finally grasp what his intentions are, it is both satisfying and exciting. I’m looking forward to an epic battle between the JLA and Rao’s Kryptonian army in the upcoming ninth installment of “Power and Glory”!